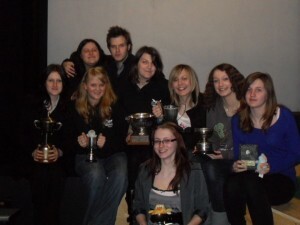 ‘The Belfrey Players began as an intermediate feeder group for members aged 16-22, and served as an opportunity for them to experiment and develop their skills before moving up to the adult group. However, over recent years Players has grown into an adult group in its own right, with an emphasis on tackling difficult subject matters, and has enjoyed great success on the festival circuit. The upper age cap has been removed, so Players is now open to anyone over 16. The Players meet every Monday and every season begins with 4-5 weeks of reading plays, after which members vote on which plays they would like to pick as their project(s) for the season. Members are encouraged to volunteer for these projects, whether it be as a director or lighting/sound assistant, or as actors. We also welcome new writing, and have produced original plays from current and past members. The Players also run workshops as part of our initiative to help develop theatrical skills. These workshops range from improvisation exercises and stage combat, to games and vocal/physical technical exercises. If you are interested in joining Players, or have any queries, please email: players@belfreytheatre.com. Belfrey Players members pay an adult fee of £10.00 per year student or £20 if working.